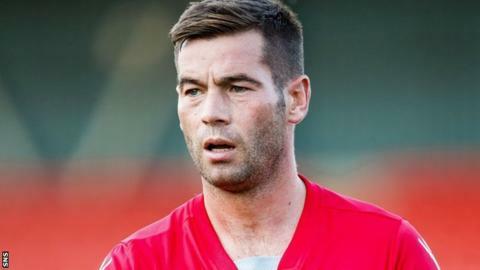 Stirling maintained their dominance at the top of Scottish League Two thanks to a comfortable 3-0 victory over bottom side Cowdenbeath at Central Park. Montrose moved up to second after edging a 1-0 win over Berwick Rangers. Peterhead made it into the top three with a comprehensive 4-1 comeback victory away to Clyde. Elgin City beat Stenhousemuir 2-0, and Annan Athletic were 1-0 winners over Edinburgh City. Stirling stretched their unbeaten run to four matches with Darren L Smith moving top of the League Two scoring charts thanks to his 10th of the season; collecting the ball from Liam Caddis and finding the bottom corner. Peter MacDonald doubled Stirling's lead five minutes later with a close-range header and Smith turned provider to set up Neil McLaughlin for the third. Montrose remain five points further back in second-place after Craig Johnston's close-range strike was enough to edge them to three points against Berwick, who dropped two places to seventh. At Broadwood, Peterhead fell behind to Darren Ramsay's opener with a very close-range effort moments after team-mate Smart Osadolor's shot was saved. However, Allan Smith struck back to level the scores, and two second-half goals in quick succession from Jack Leitch and Russell McLean handed the away side a cushion. Rory McAllister added the gloss with just over 15 minutes remaining as he picked out the top corner. Elgin sit just outside the top four after a 2-0 home victory over Stenhousemuir, who started the weekend second and dropped two spots. Brian Cameron stuck a penalty into the bottom left corner after he was felled in the box by Ross Meechan after 56 minutes, and Thomas Reilly doubled their tally after 75 minutes thanks to a long-range cracker. Aidan Smith's 72nd minute penalty was enough as Annan Athletic edged past second-bottom Edinburgh City.